It is virtually impossible for us to imagine nowadays the impact that Mahler�s First Symphony must have had on the audience at its premiere in 1894. To people accustomed to the music of Haydn, Mozart and Beethoven and for whom Brahms was contemporary music, Mahler�s sound-world must have seemed strange indeed. Instead of the traditional orchestral sounds the audience heard the high violin harmonics with which the work opens; frequent primeval rumblings in the bass of the orchestra; gong strokes; the eerie double bass solo at the start of the third movement; and, of course, the great catharsis with which Mahler opens his finale. Strange sounds indeed! 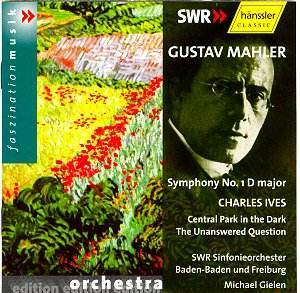 Mahler was untying the knots of convention in this work and forging a new vocabulary of orchestral timbres. I mention this because it seems to me that if a performance of this symphony is to succeed there must be an element of wildness about it. To my mind Michael Gielen�s scrupulously prepared performance fails in this important respect. It all sounds a bit careful and calculated whereas the best Mahler conductors sweep all before them. I�m thinking particularly of Klaus Tennstedt (his live 1990 recording with the Chicago Symphony Orchestra for EMI) and, above all, of Leonard Bernstein in his elemental live reading from 1967 with the Concertgebouw Orchestra (DG). In the pregnant opening paragraphs of the work Gielen (and his engineers) achieve a splendid clarity of texture, as indeed they do throughout the performance. However there�s little sense of mystery. When at length Mahler reaches the main body of the music everything is splendidly played but there isn�t much evidence that the players are being stretched. It all sounds easy � a bit too easy? I miss the sense of drama that either Bernstein or Tennstedt convey in abundance. Another quality that�s lacking is the humanity of, say, Barbirolli (his 1957 Hallé account, now on Dutton.) Paradoxically, when, in the coda, Gielen whips up the music his chosen tempo sounds a bit rushed. The Ländler second movement is done very efficiently. However, I listened in vain for any trace of schmaltzy humour. I must also say that Gielen�s core tempo seems too brisk. Mahler adds to his tempo indication the important rider "doch nicht zu schnell." (but not too fast). Gielen overlooks this. Though I�m wary of the stopwatch as a musical guide it�s surely significant that Gielen takes 6�59" for this movement whereas Barbirolli takes 8�14", Tennstedt 8�26" and Bernstein 8�55". In each case the additional weight the latter three impart to the music is beneficial. Gielen�s rendition of the third movement is of a piece with the rest of his interpretation. Everything is clearly laid out and accurate but this is not enough. Certainly there�s more to the vast finale than Gielen is able to find. The opening eruption is accurate but it didn�t stir this listener. In these opening paragraphs the tension should be screwed up to breaking point. Tennstedt achieves this while Bernstein is in a different league from everyone. It�s not just in the moments of high drama that Gielen fails to deliver. The great lyrical string melody (track 4 from 3�31") is nicely played, but try Barbirolli or Bernstein here. Their players are really encouraged to dig in and, as a result, the music tugs at the heartstrings (Tennstedt rather overplays his hand here, I think.). In summary, I�m afraid that Gielen fails to convey adequately the tensions in the music in this movement and, indeed, throughout the work. There�s no real bite to the performance and I found myself completely unmoved at the end. As he has done throughout his Mahler cycle Gielen chooses unusual, even provocative couplings. This is the case here with the inclusion of two Ives pieces. There is a link of sorts because the pieces were completed in 1907 and 1908, just before Mahler�s brief New York period. I don�t know if that�s the reason for their inclusion but they make a fascinating choice to partner the Mahler. The two works also are good companions for each other. In The Unanswered Question (1908) Gielen�s talent for clarifying textures serves the music very well. He presents this gravely beautiful yet quirky music admirably. He�s just as successful with the more complex textures of Central Park in the Dark. He clearly has an excellent ear and I must say I found him more persuasive in Ives than in Mahler. I�m sorry that I can�t be more enthusiastic about this issue. As I said earlier the performances have clearly been prepared very thoroughly and throughout the orchestral playing is first rate, as is the engineering. The English translation of the German notes is not all that good, I�m afraid. If you are collecting Gielen�s Mahler cycle you�ll know what to expect. For those wanting a single library version of this amazingly original symphony I can only advise that you look elsewhere. Tennstedt (and several other conductors) have much more to say about this work and as for Bernstein his DG account is simply in a class of its own. That�s my personal recommendation; I�m afraid it leaves this Gielen performance standing.